KLYM, Mary Maria (nee Ustenko) - Born June 7, 1923 in Lwov, Ukraine and passed away peacefully on Thursday March 1, 2018 at Scarborough Centenary Hospital in her 95th year. 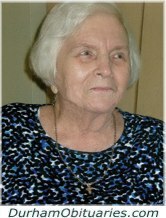 Beloved wife of the late Ivan Klym. Mary will be lovingly remembered by the Avdiev Family in Ukraine and many friends in Canada. FUKE, Dmytro - After a valiant struggle, Dmytro Fuke passed away during the early hours of March 1, 2018 at the age of 97. Predeceased by his dear wife Nina after 63 years of marriage, Dmytro was a deeply loving and sensitive man who was above all else devoted to his family. SHINGLER, Maryann (nee Kalynko) - Suddenly at home on Thursday, March 1, 2018, in her 70th year. Treasured mom of John and his wife Jana, and Krystalann and her husband Ted. Cherished grandmother of Brooke. Sister of Mike and his wife Barb Kalynko, Gary and his wife Judy Kalynko. KELLOUGH, Don - 1954 - 2018 Passed away suddenly on Thursday March 1, 2018. Beloved husband of Angie Kellough and loving son of Irene Kellough. Dear brother of Kathy and Craig Kellough and brother- in- law of Marti Kellough and uncle to Corey and Candace Kellough. BRADBURY, James - Peacefully, after a long courageous battle with cancer, on Wednesday, February 28, 2018, at the Lakeridge Health Centre, in Oshawa, at age 71. Jim Bradbury of Port Perry. Loving father of Sarah and her husband Dave Glasbey, and Lauren and her husband Brad Sharer all of Port Perry. Loved poppa of Katelyn, Evan, and Noah. HALL, William 'Howard' - Former owner of House of Howard and Mayor of the Township of Scugog, it is with great sadness and broken hearts we announce the peaceful passing of Howard, in his 89th year, on Wednesday, February 28, 2018 at Uxbridge Cottage Hospital with family by his side. Howard was the husband of the late Zula Hall for 61 years. Much loved Dad of Ted (deceased) and Gina Hall of St. Catharines, Jennifer and Ron Down of Port Perry, and Cathryn Hall of London. MACLEOD, Edith Maude (nee Crawford) - Age 82, went to be with her Lord on February 28, 2018. Reunited with her beloved husband of 52 years, the late Leonard MacLeod. Devoted mother to Laurie MacLeod and Carron (Garth) Jensen. Cherished grandmother of Joshua (Cherry) and Caleb Manning. HEWETT, Henry James “Chick” - Peacefully at Lakeridge Health Oshawa with his family by his side on Wednesday, February 28, 2018, at 96 years of age. Beloved husband of the late Betty. Cherished father of Glen and his wife Anita and Wendy and her husband Jim. Adored Grampa of Lauren (Tim), Kerry, Sam and Jared, and Great Grampa of Olivia and Emily. TEMPLAR, Eleanor - It is with heavy hearts we announce that Eleanor Templar (nee Hinds), lovingly referred to as “Darlin’” by her great-grandchildren, passed away on February 28, 2018. Eleanor is predeceased by her daughter Anne (Scot), her brother Ted (Eve) and husband Ron. She is survived by her daughter Lynn (Paul), granddaughters Amanda (Andrew), Natasha (Garrett), Amy (Jay), Maggie (Griffen) and her 5 great-grandchildren. FRANCIS, Irene Violet - Passed away peacefully on February 28, 2018 into the arms of her Lord, in her 79th year. Dear wife of the late David Francis. Beloved mother to Kimberly Knapp, Kenton (Joanne) Knapp and Robin Wicks. Step-grandmother to Michelle (Ruben) Rodrigues. ARBOUR, Tyler - Unexpectedly on Wednesday, February 28, 2018, Tyler Kelly Clyde Arbour passed away at Lakeridge Health Oshawa with his family by his side. Beloved son of Jane Arbour and the late Kelly Arbour. Brother to Riley (Trish), Caitlin (Ryan), Rachele (Dylan) and Travis. KOVACSEVICS, Eva - Passed peacefully after a lengthy illness on Wednesday, February 28, 2018 at the Lakeridge Health Ajax and Pickering Hospital. Eva, beloved wife of John. Dear sister of Arpad of Australia. PAPALEO, Adam John - It is with great sadness and heavy hearts we announce the passing of Adam in Cambridge, Ontario on Wednesday, February 28, 2018 at the age of 46. Loving son of Gail and Tony. Brother of Marc (Lori) and Apryle (Clarke). MOOYER, Cornelia Geertruida (nee L’Ami) - Peacefully on Wednesday February 28, 2018 at Northumberland Hills Hospital, Cobourg in her 87th year. Cornelia, beloved wife of the late Albert Cornelis Mooyer (2002). Treasured mother of Tina Vanderzwet (Garry), Nellie Massaar (Calvin), Albert (late Barb), Gerda Landry, Mary Beer (Tammy Watson), Jane Kingston (John), and the late Petrus (1957). 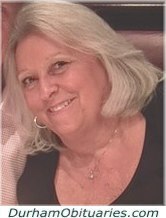 CARROLL, Rita Marie (nee Daniel) - It is with broken hearts that the family announces the sudden and unexpected passing of Rita Marie Carroll (nee Daniel) on February 28, 2018. Beloved wife who lived life to the fullest with her husband and soulmate George. BALA, Radu - Peacefully on Tuesday February 27, 2018 at the age of 60. 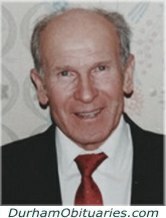 Radu, beloved husband for 39 years of Vera Bala (nee Popa). Much loved father of Cristian Bala (Rachel), Alexandra Steliga (Ryan), and Iulia Zwicker (Christopher). Proud grandpa of Timothy, Hope, Ethan, Bryce, Sophia and Charlotte. 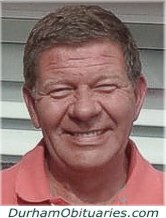 LUTZ, Edward - Passed away in the early morning on Tuesday, February 27, 2018 at Lakeridge Health, Bowmanville. Predeceased by sisters Cora Allenbach and Mae Davis. Uncle Eddiy will be missed by Debbie Gray (Alvin), Nancy Thomas (Dan), Larry Davis (Kym), Phoebe Rodriguez (John) and Henry Allenbach and several great and great great nieces and nephews. FALCONERI, Angela Maria - (30-Year Employee of Chrysler Canada) - Peacefully at Lakeridge Health Oshawa on Tuesday, February 27, 2018 at 82 years of age. Beloved wife of the late Salvatore Falconeri. Loving mother of Peter and the late Joseph. SPINA, Rosario - It is with heavy hearts the family announces the passing of Rosario Spina on February 27, 2018 in his 86th year. Beloved husband of 20 years to Gilda Tulipano Spina. Predeceased by his cherished wife Maria (May 1993). Loving father of Gina (Carmine) Bruno, John (Jayne) and Dino (Shirley).